The north of Ibiza is well-known for its bohemian, laidback lifestyle and spectacular scenery, and the village of San Juan (officially Sant Joan de Labritja) is one of the greatest examples of this. Despite the small size, Sant Joan is the centre of the municipality to which it is named. It is the most uninhabited, but also one of the most beautiful traditional towns on the island. The area also stands out because of its hippy community that has settled here looking for an alternative way of living and a healthier lifestyle. There are countless reasons to be interested in a Sant Joan property. There are a number of properties in this popular location including authentic fincas, chalets and luxury villas. Many of them are enclosed in Mediterranean gardens with palms and fruit trees. In this quiet countryside setting, second-home owners are provided with absolute privacy, only a few minutes’ drive away from the next town and its diverse facilities. The average price for a house on Sant Joan property market hovers around Average price per sqm. in Sant Joan de Labritja €6,365 0% properties#: 39 last change on: 19 Apr 2019 €6,365 per sq. meter. A highly appreciated sea view position adds a premium value on the top of the selling price. The most active real estate agencies in the area are Luxury Villas Ibiza, The Agency Ibiza and Zan Ibiza with the highest number of listings on Sant Joan property market in 2017. There’s not a lot going on in San Juan, and that’s its main attraction. This classic and quaint Ibiza village is remaining genuinely untouched by regular tourism. In fact, there is not even the smallest hint of a souvenir shop around. This only adds to its charm and brings a feeling of admiration and respect from all who visit it. That said, San Juan caters wonderfully for its relaxed yet vibrant community and visitors alike. The surrounding landscape is very mountainous, which delivers great panoramic views across the countryside. Moreover, this rural environment is an ideal place to many agro-resort establishments. Visitors come here to get away from the rush of the modern life, and see Ibiza at its traditional best. Adventurous hikers won’t be disappointed as the area around of Sant Joan is a paradise for trekking and hiking, offering awesome trails to be walked. They lead to Balanzat tower, underground caverns of the Cova de Can Marçà and magical archaeological site of the Es Culleram cave, which houses the main remains of the Phoenician age, namely the goddess Tanit. Although the village itself is situated away from the coast, it is in convenient proximity to the excellent family-friendly northern resorts, such as Portinatx and Cala San Vicente, sandy beaches and secluded bays. 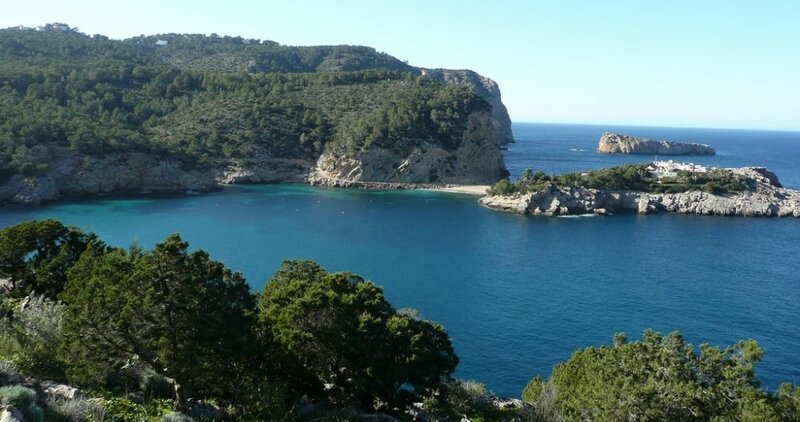 For example, if you are looking for a romantic escape and want to enjoy relaxation away from the noisy resorts you should consider visiting the coves (or ‘calas’) of Xarraca, Benirrás, d’en Serra, S’Illot and Moltons. You will want nothing more than to rest your feet on these golden beaches. As usual, the centre of the village is dominated by an imposing 18th-century spotless whitewashed church. In the town, there are numerous white houses built in the typical style of Ibicean architecture. The quaint buildings with flower-bedecked and wrought iron balconies, lining the main cobblestone street, still lend an enchanting traditional Ibiza feeling and peaceful vibe to the village. It is featuring a number of small cafes and restaurants serving everything including traditional Mediterranean dishes, gourmet and natural food. Ones of the most locally well-known are Vista Alegre, El Kiosko, the Giri Cafe, and newly-opened Es Club. The town of San Lorenzo is close by, which means lunch or dinner at the iconic La Paloma Café is a “must do” option. 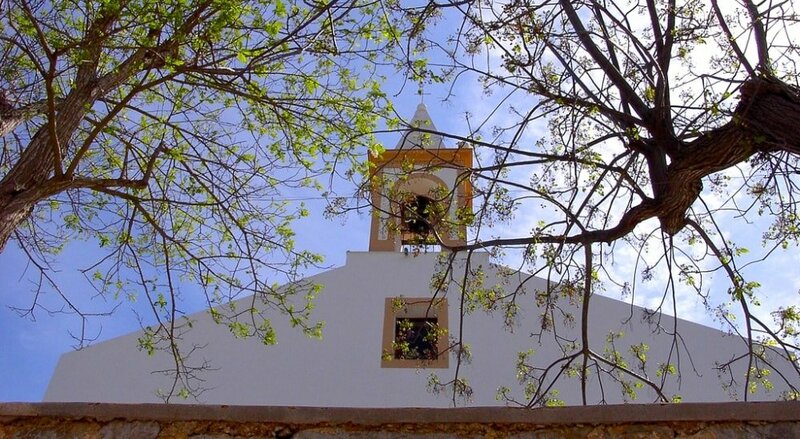 This normally quiet town becomes alive with its famous Sunday market and during the San Juan’s Patron Saint festival on 24th June each year, when islanders from all over Ibiza descend here. The eclectic artisan market on Sundays features different market stands in the main square and across the tiny streets. The stalls are well spaced apart stocking all manner of unique and hand-made goods and crafts, from handmade soap to jewellery and ceramic pots, and even musical instruments. Also here you find all kind of local organic food and produce, including the popular traditional Ibiza liquor, high-quality speciality coffee, olive oil, herbs and spices, as well as delicious jams and cakes. Live musicians performing surely add to this quaint and laid-back Ibiza market atmosphere. In a nutshell, this market is a place to go if you are looking for a unique gift or a special treat for yourself. In turn, during the San Juan’s festival, the village is vibrant with music, folk dances, traditional games, and also a market held on the main square. Moreover, the bonfires are lit to dance around. On top of that, a tasting of local wine, traditional sugary pastries (bunyols) and Macarrons de San Juan (local pasta dish) is a nice addition to the festivity. Sant Joan is a good base to explore the rest of Ibiza. It is located just 15km north Santa Eulalia and 23km north of Ibiza Town, where you will find a boisterous and cosmopolitan atmosphere. This way, the area of Sant Joan is perfect for those willing to relax and get back to the days when the island was a quiet backwater of Spain.